I have absolutely no recollection of weaving anything in my entire life but I have wanted to learn to weave since visiting family friends in Haida Gwaii when I was 17 years old. The trip made quite an impression on me and I have since hoped to return again one day. From the untouched beaches, to the eagle frenzies at sunset and the people who live there, Haida Gwaii is nothing like anywhere else I have ever been in the world. The friends we were visiting have lived there for many years and Laura, in particular, made an impression on me because she was a weaver. Her floor loom in their basement (actually their ground floor, not a below-ground basement you think of when you hear ‘basement’) featured the loom, large and imposing. Ever since, I have wanted to weave. All this to say that I have continually put it off for the simple reason that handspinning and knitting have taken my focus. Really for no other reason than that I really really really love them! So why now take the jump into weaving? Our guild is participating in a gallery show in January 2017, called The ABC’s of Fibre Arts, and I happen to have ‘C is for Corespun’. 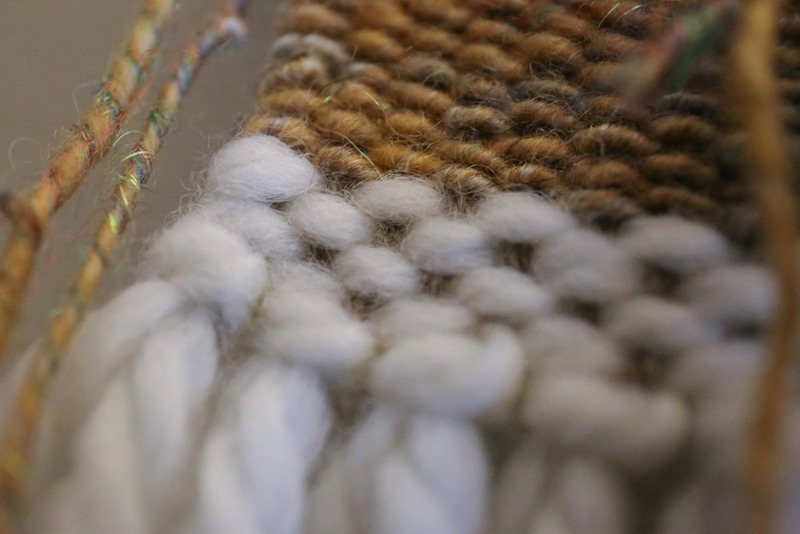 One of the beautiful applications for corespun happens to be weaving with it. 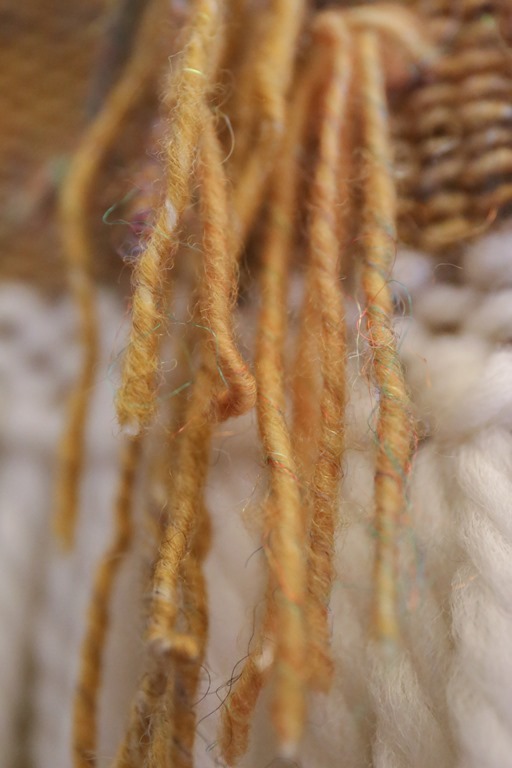 I have increasingly felt that for my presentation, having a woven piece will be necessary to showcase the various aspects and uses of corespun yarn. 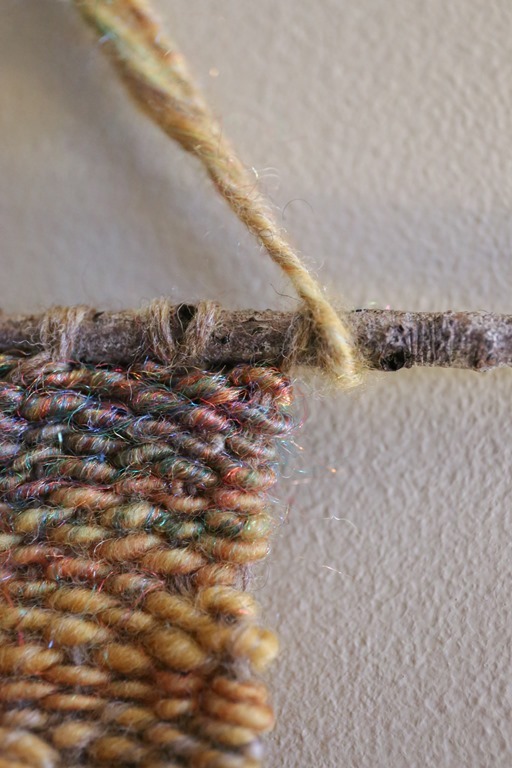 After all, placing it in awesome tapestry weavings was really the reason I wanted to make corespun in the first place! After picking up my June fibre club at the Sweet Georgia Yarns’ studio, I went over to look at the fibre and saw that the new Zoom Loom from Schacht was on display. These are quite expensive little looms and I have hummed and hawed about getting one for a while now. I think it was a moment of weakness that I ended up buying one, mostly because I wanted to get going on having a little weaving to feature in the gallery show! Finally, I had an opportunity to sit down and learn how to use this thing. For my purposes for the show, the way to use the pin loom wasn’t really want I wanted. For the weavers who might be reading this, excuse my ignorance on the subject but of course, we all have to start somewhere! 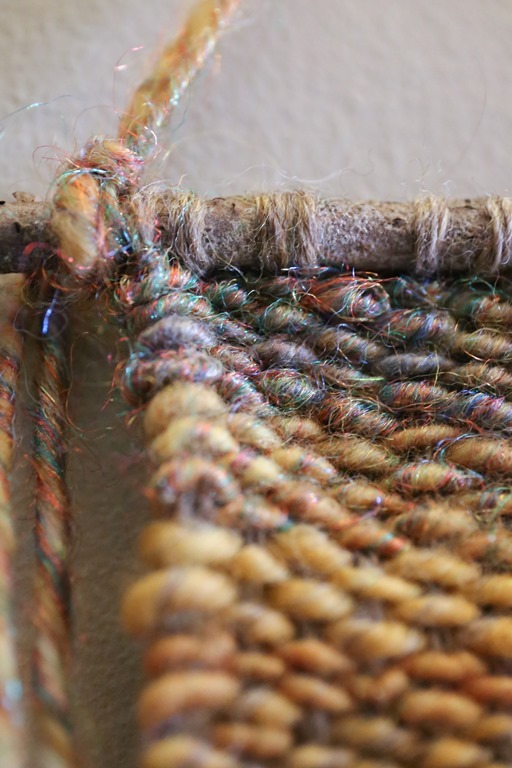 After creating one weaving using the pin loom the way it is designed to be used, I decided to use it more as a frame loom and warped it from top to bottom only. Sorry that I don’t have photos but when I repeat this process, I’ll be sure to take photos. And the results did not disappoint! It is by no means perfect and there are some areas that I know are mistakes but overall, it was really fun and effective for what I was looking for to show corespun off in a weaving. I have to be clear that I have no idea what I’m doing. Most of the ‘embellishments’ that I added to this weaving were things I’d seen on Instagram and figured I could add them myself. There was no looking on the Internets or YouTube to find out how to actually do these things! I think I need to explore some of the resources out there so that I can learn how to do these things properly. While the bottom of the weaving once I popped it off the pins wasn’t going to come undone, I decided to add a completely unnecessary fringe just to see what it would look like on the finished piece. I also didn’t trim the bottoms to ensure they were the same length but I may still do that. I actually really like things that aren’t too perfect so chances are, knowing myself, I’ll leave them as is! This corespun retained much of its twist, even after setting it. I thought this added interest to the tassels and is the reason for not trimming the hanging ties. I just really liked them! Finally, the ‘branch’ … which is more of a stick. I scavenged it from James’ stick pile in the front yard before they went to bed and he was very pleased that I was ‘going to make something with his sticks’. It is definitely not the most sturdy stick in the world but because this is incredibly light, it doesn’t matter. The effect is the same: Rustic and natural. Other than the firestar. Which is fun and reflective so really? It is a win in my book! Are you a weaver? Do you want to learn? 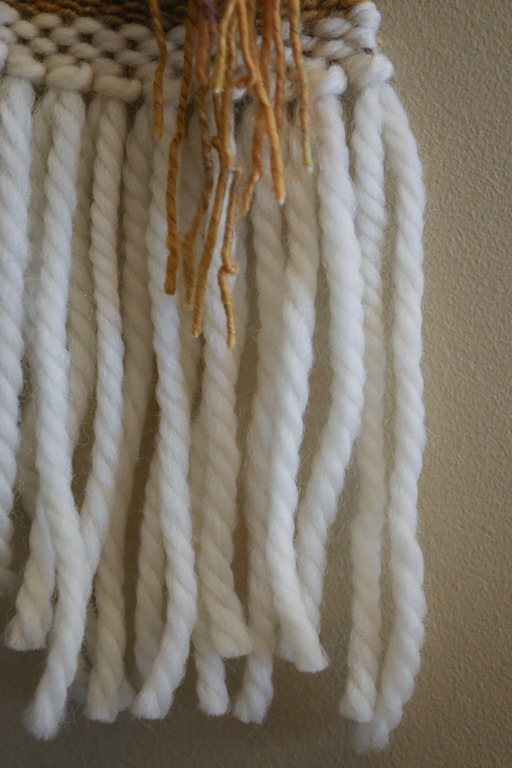 What draws you to weaving? I’d love to hear about your experiences! I started weaving when my youngest was born. We did a lot of babywearing with woven wraps and I loved the hand woven wraps. The weavers represented a niche where two of my passions met and I’ve loved it ever since :-) sometime when I’m threading 400+ heddles I have to remind myself of that lol I hope you love it and continue! I go back and forth on weaving. I have done some weaving, but it goes in fits and spurts. That project is really lovely though! What an interesting and beautiful texture that creates! I’m a novice weaver and I’m so alluded by texture at the moment. I’m hopeful that by the end of tour de fleece j have enough yarn to experiment with weaving it. I had seen weavers and spinners as a little girl in the historic village of Batsto, NJ and ever since then had wanted to become a weaver and spinner. Fast forward some 45+ years…here I am! I started weaving this past Christmas. So far I’ve only managed to make a table runner and 2 kitchen towels. My loom is warped for 6 more towels! When the pup stops teething and gets a few more manners weaving will commence once again. I think I have enough in small skeins to make a nice scarf for myself. I love it! Why did it take me so long to pursue my fibery dreams?! Doesn’t matter. I’m doing it now. Really interesting! 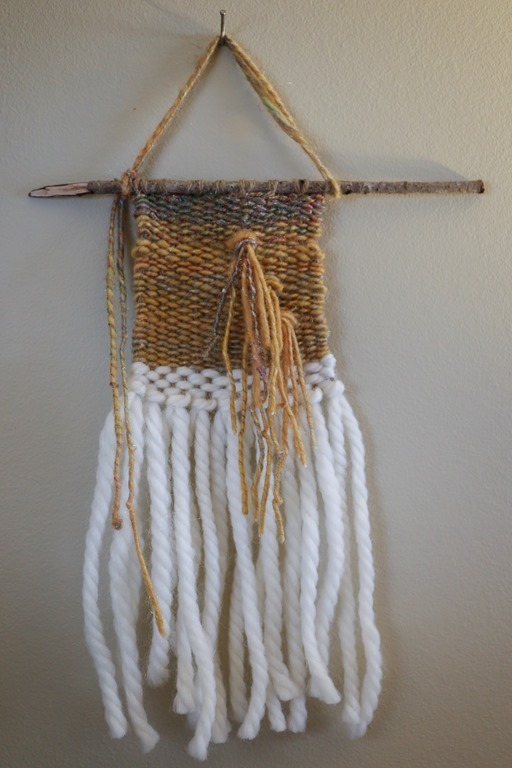 I’ve been thinking of bringing my little loom down from it’s storage space in the garage, but you’ve got me wanting to play around with something like a weaving frame now! I love the look of the corespun once woven! Is the fringe at the bottom handspun as well? It’s not – it’s old stash I had lying around. 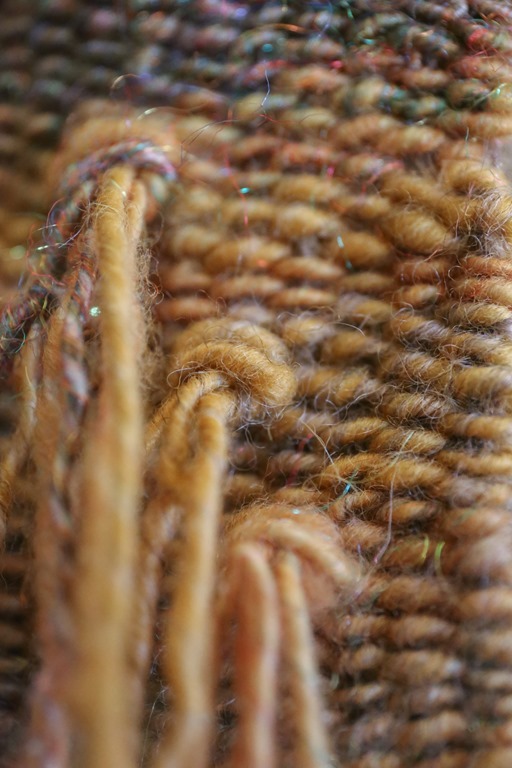 Wouldn’t it be wonderful one day to only weave with handspun? !